LSE’s Jennifer Baka argues that India’s wastelands are political constructions, and the political processes to define them are reshaping rural livelihoods in unanticipated ways. How do government land classification processes impact rural livelihoods? I analyse these dynamics through the lens of ‘wasteland’, an official government designation for degraded lands in India. In 2009, after nearly a decade of debate, the Government of India passed a National Policy on Biofuels, which mandates growing biofuels on wastelands. This strategy, the government asserts, would help improve the country’s energy security, avoid competition with food production, minimise threats to climate change and provide development opportunities to the rural poor. Yet nowhere in the policy does the government define what wastelands are or how such lands will be identified for biofuel production. My research finds that wastelands are political constructions – a malleable categorisation that the government has repeatedly re-defined to meet its policy needs – and that the impacts of these political processes are reshaping rural livelihoods in unanticipated ways. The term ‘wasteland’ dates back to John Locke who used it to refer to any lands that were not privately owned. Arguing that the returns of privately held lands would far exceed those of wastelands, Locke advocated reducing wastelands through privatisation. As scholars such as David Gilmartin and Vinay Gidwani have documented, this thinking was highly influential both in India’s colonial land settlement schemes and in creating a social divide between coloniser and subject. Yet the term did not disappear with Indian independence. Instead, the post-colonial government continued a programme of wasteland development that took a unique, industrial twist during the 1970s. In this period, the government began advocating tree planting on wastelands as part of the country’s Social Forestry programme. 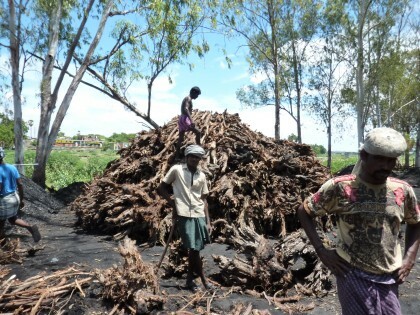 Although marketed as a programme to increase fuelwood supplies for rural communities, tree species selected for the programme, such as Eucalyptus and Prosopis juliflora, were better suited for the emerging pulp and paper industry than for fuelwood. A similar logic has motivated the country’s current biofuel programme. I am currently working on a paper that analyses wasteland development since the time of Social Forestry to illustrate how developing wastelands has become the country’s solution for addressing India’s energy, climate change and rural development challenges. Thinking more holistically, I argue that wastelands encompass biophysical, economic, political and social dimensions. Yet, in a forthcoming paper in Geoforum, I find that stakeholders involved with India’s biofuel programme discuss wastelands using a different dimension of this spectrum. Policymakers and biofuel companies discuss wastelands in terms of their economic and biophysical qualities while NGOs and village leaders emphasise their importance to rural livelihoods. However, because of the political power of government and corporate stakeholders relative to civil society stakeholders, wastelands are reduced to economic and biophysical landscapes in policy documents. Narrowing the framing of wastelands and obscuring their social and political significance can lead to unanticipated policy outcomes. In other work, I document two such outcomes: ‘land grabs’ and competition with a local biomass energy economy. In a paper published earlier this year, I analyse how the ambiguity of wasteland classification has helped to facilitate ‘land grabs’ in rural Tamil Nadu (Baka, 2013). At present, multiple government-sponsored wasteland classification processes exist each using different definitions and methods and, not surprisingly, yielding different results. Additionally, the National Policy on Biofuels is not the only wasteland development policy currently underway in India. Most prominently, the country’s National Mission for a ‘Green India’ and Special Economic Zones Act also seek to develop wastelands for different purposes. Collectively, these programmes increase the demand for wastelands. Yet, the ambiguity of government classification processes has created space for an emerging class of land brokers who navigate the various land classification and registration processes to create contiguous blocks of wasteland. In the particular 800-acre area in rural Tamil Nadu I studied, many plots involved in this aggregation were privately owned. Yet the broker land acquisitions occurred without the owner’s knowledge or consent. Recent changes to India’s land acquisition laws have reduced owner’s abilities to contest these transactions. As result, the ability of these farming communities to self-provision is in question. Holding government designations of wastelands fixed for a moment, how are such lands currently used? In the most memorable component of my fieldwork, I find that biomass on Tamil Nadu’s wastelands currently supports a dynamic energy economy servicing both household and industrial consumers in both rural and urban settings. This biomass, principally Prosopis juliflora, which was introduced under Social Forestry, would have to be removed for the government’s biofuel programme to be established. Using a comparative energy flow analysis framework, I compared the energy services provided by Prosopis to what would be offered by Jatropha curcas biodiesel, the government’s most widely promoted biofuel feedstocks. 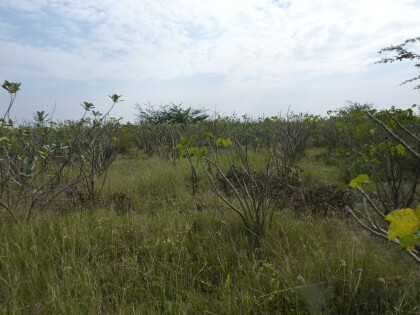 The Prosopis system provides approximately four to 12 times more energy services than would Jatropha. Further, the energy services of Jatropha are not exact substitutes for Prosopis. Jatropha biodiesel is a transportation fuel while Prosopis is used as a fuelwood for households and rural industries and as a feedstock for electricity and charcoal manufacturing. By-products from Jatropha production, such as the seedcake that results from crushing Jatropha seeds, could theoretically replace some but not all of the existing Prosopis energy services. However, Jatropha production would be privately controlled whereas villagers and companies can freely cut Prosopis at present. Therefore, economic forces would likely determine what portion, if any, of Jatropha by-products would be used to replace Prosopis energy services. Thus, replacing Prosopis with Jatropha could reduce, rather than improve, energy security. If I were to make one policy recommendation from this research, I would advocate that we focus on understanding the multiple dimensions of land use. Such thinking creates a platform for interdisciplinary research and systems thinking, which in my opinion, is the best strategy for anticipating possible unanticipated outcomes of policies. Jennifer Baka is presenting her paper, “Biofuels and Marginal Lands: Interrogating the land use change impacts of Jatropha promotion in south India”, at the Grantham Institute on Wednesday, 13 November, at 12:30 p.m.
Dr Jennifer Baka is an Assistant Professor in LSE’s Department of Geography and Environment. Baka, J (2013), “The Political Construction of Wasteland: Governmentality, Land Acquisition and Social Inequality in South India”, Development and Change, 44(2), 409-428. Baka, J (forthcoming) “What Wastelands? A Critique of Biofuel Policy Discourse in South India”, Geoforum.